The Factory Outlet at the Factory! When you visit Holley Ross Pottery, it's an experience you'll undoubtedly want to repeat! Our factory showroom is located in LaAnna, Pennsylvania on Route 191 between Cresco and Newfoundland, which is considered one of the most beautiful drives in the Pocono Mountains. You can save up to 70% and more! Our prices and variety of selection are what make people come here and then keep coming back! 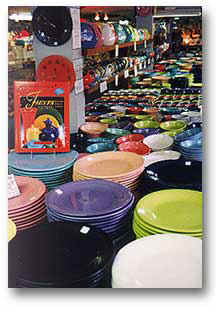 Holley Ross offers genuine Fiesta dinnerware, Hartstone hand-painted stoneware, Pilgrim glassware and many other products at savings up to 70%. We buy this merchandise by the truckload and pass these savings to you. Imagine your gift being made right before your eyes! Our free pottery demonstrations are educational, entertaining and enlightening. 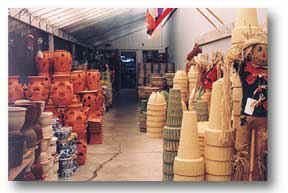 We have a large factory showroom where you may purchase items made at the pottery at wholesale prices! We also have a lake and forest woodland park where you can walk across a rustic swinging bridge into a beautiful forest with sawdust trails that take you to picnic tables and a picturesque lake! Banks and so much more . . . The Holley Ross Pottery showroom is open to the public Monday through Saturday from 9:30am to 5:30pm and on Sundays from 1:00pm to 5:30pm. During the year, we are open May 1st through mid-December. There is enough free parking to easily accommodate tour buses. We would appreciate advance notice of bus tours, but it's not necessary. Times for demonstrations for bus tours may be arranged at times other than the regularly scheduled times. We look forward to seeing you and are genuinely happy to pass these great savings along to you! Click here to find a coupon for a FREE Mug with a $20 purchase. "One Per Family"
Our showroom is open to the public May 1st through mid-December!